VANCOUVER, British Columbia — For Harvard graduate Brayden Jaw, this was a chance worth giving up his career for. 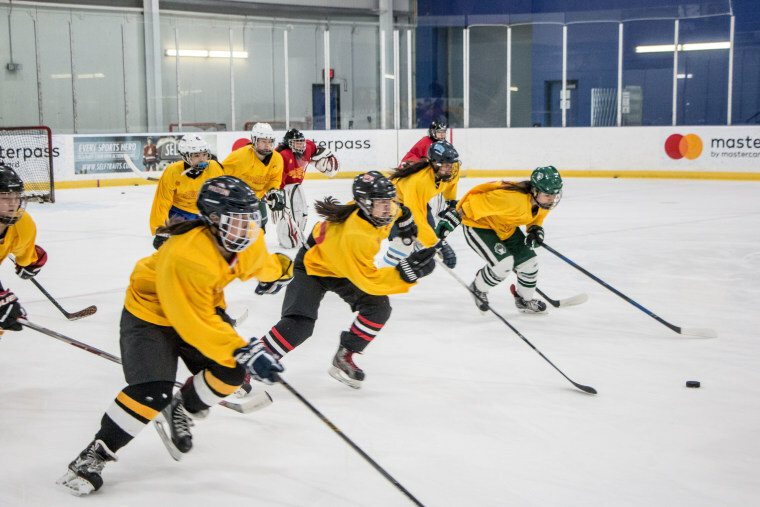 In early June, Jaw was one of more than a hundred North American male and female ice hockey players of Chinese descent competing for spots on Team China in try-outs held in Toronto and Vancouver. The 25-year-old, who hasn't played high-level hockey for almost a year, had turned his skates in for a suit. The investment banker told NBC News that he couldn't turn his back on a childhood dream. "For me, going back to China this year — I just loved it. Some of us might have been born overseas — but at the end of day, we are Chinese." "I've always wanted to play at the highest level," he said. "If I do play for Team China in 2022, I can carry that experience forth in the business world." In 2022, Beijing will be hosting the Winter Olympics. Because there aren't enough elite native-born Chinese hockey players, the national team is searching everywhere for talent. While Jaw's parents aren't from Mainland China — Thomas Jaw is from Taiwan and Brenda Jaw is from Honduras — both are of Chinese descent, which is the only requirement, besides hockey skills, to be invited to these camps. According to international hockey by-laws, a non-citizen must play for two consecutive years in his adopted country before being eligible for its national team. "It's good," Charles Yuen, a Chinese business executive who helped China set up the try-outs, told NBC News. "It's opened up opportunities for kids who just want to play the game." "Taiwan. Hong Kong. Mainland China. Macao. What's the difference? We're all Chinese," he added. "The bottom line is he's Chinese," Hong Kong native Gary Lee told NBC News when speaking of his Canadian-born son, Nick Lee. The 17-year-old high school junior hopes one day to be a goaltender at a university which also has a respected engineering program. If Team China calls after that, great. "It'll be weird to play for another country," the netminder told NBC News, "But it'd still be cool." "It's just an opportunity to see what else is available," noted his father. "If they can represent, that's great. If not, it's still a good experience." Part of the experience at the try-outs was being around legendary coach Mike Keenan, who led the New York Rangers to a Stanley Cup in 1994, and is now spearheading China's efforts to build "the biggest hockey program in the world." According to Keenan, the top of this pyramid is the country's premier professional outfit, the Beijing-based Kunlun Red Star, which made its debut last September. The Red Star are part of the Kontinental Hockey League, which features teams across Europe and Asia and is widely regarded as the world's second-best hockey league after the National Hockey League. Next year, at least seven players of Chinese descent will be on their roster, including Charles Yuen's son, Zach Yuen. Around Kunlun, a far-reaching infrastructure will fuel this organization. Keenan said that up to five men's farm teams, featuring as many skaters of Chinese descent as possible, will be affiliated with the Red Star. On the women's side, Kunlun will be entering the Canadian Women's Hockey League next season. In Toronto, the Red Star will open Under-20 and Under-18 men's hockey academies. In Boston, there will be an Under-18 women's academy. These try-outs will help populate those endeavors. In addition, Keenan said that China intends to go from 250 rinks nationwide to 1,000 by 2022. These fresh sheets of ice will introduce 100,000 kids to skates each year, keeping with President Xi Jinping's goal of getting "300 million Chinese to participate in winter sports" by the Beijing Winter Games, as reported by China's state-owned news agency Xinhua. These ventures will enjoy a direct pipeline to the 2022 national team and hopefully, beyond. Nobody will be happier to see this than Zheng Fengrong, who broke the high jump world record in 1957. She was the first Chinese woman to hold a sports world record and one of eight athletes chosen to carry the Olympic flag during the Beijing 2008 opening ceremonies. Her grandson, camp invitee Ty Schultz, couldn't attend because of a sports hernia. But the 20-year-old defenseman is eyeing more than just a golden opportunity with Team China. "It's just an opportunity to see what else is available. If they can represent, that's great. If not, it's still a good experience." "She never got a chance to go the Olympics because China didn't participate around her time," Schultz told NBC News. "It would be a great opportunity for her to live that through me." Speaking of opportunity, Zach Yuen has made the most of his. About this time last year, the Vancouver-born Yuen's career seemed to have plateaued, as he was toiling for the Idaho Steelheads in the middle rungs of North American pro hockey. But after a solid campaign with Kunlun, the 24-year-old is on the cusp of donning the red and yellow of Team China in international competition. "For me, going back to China this year — I just loved it," Yuen told NBC News. "Some of us might have been born overseas — but at the end of day, we are Chinese."